Online: All our tours and transfers can be booked online up to 12 hours before departure. Your booking is confirmed automatically when we send you an email with confirmation and terms of payment. Phone: We offer a 24 hour booking service 7 days a week for all of our tours and transfers. Our booking service can be reached at 00 354 846 3837. Email: Bookings by email [email protected] can be made for all tours up to 12 hours prior to tour departure. Pick up service for the all our tours/transfers: We offer free pickup from all of the accommodations in the capital area of Reykjavik only. ATTENTION! The Reykjavik Center is located in the forbidden zone for all vehicle operated by tourism companies. Pick-up/drop off from many accommodation in the city center are not possible directly in front of the door. If we can’t pickup/drop off directly to the front doors of your accommodation after reservation, we will send information how to walk to nearest Bus Stop. 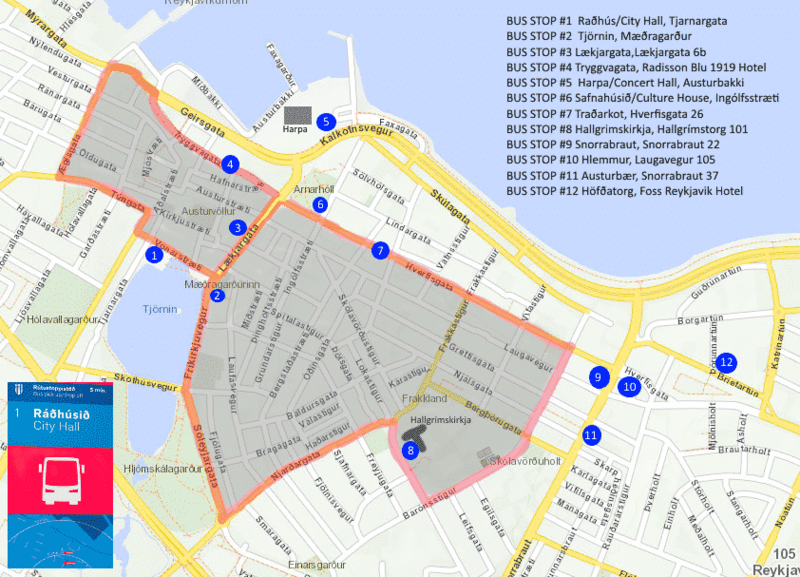 Please check Bus stop/pick-up points in the forbidden zones from the Authorities. Click to enlarge image map. Please be prepared outside your pick up location at the tour start time on your order. Pickup usually can take up to 30min depending on traffic and weather conditions and your place in the pickup order. Pickup can take up to approx.10 minutes for the all Private tours and Private transfers, also for all transfers via Blue Lagoon. Change of reservation: It is possible to change a reservation up to 12 hours prior to tour departure, free of charge. We reserve the right to alter or change the itinerary according to weather and road conditions this could happen 30 min before departure. We would contact you with information and if we do not have that we would contact your accommodation and let you know no later then 30 min before departure. You can cancel free of charge more than 24 hours before the departure. If your tour is canceled by us, due to a situation beyond our control, we will provide a full refund. All our day tours we must have a minimum two passengers and if you are traveling alone we may cancel the tour 24 hours prior to departure with a full refund. If weather conditions are extreme we may also cancel up to 30 min before departure if it is dangerous to operate a tour, in a situation like that we will provide a full refund if re-scheduling another date is not an option. Payments: All payments are made either online or on site of designated pickup site. Payment can be made either by cash or Master, Visa debit/credit cards. We highly recommend you book and pay online, that gives you a 5% discount. Tour departure /Complimentary pick up service / Drop off service: We offer a complimentary pick up service for all our tours. Passengers are requested to be ready outside at pickup point, your hotel/guesthouse reception or lobby at the pickup time in correct pickup order we will pick you up within 30 minutes. Pickup can take up to approx. 30 minutes for the all Day tours and Regular transfers. Pickup can take up to approx. 10 minutes for the all Private tours and Private transfers , also for all transfers via Blue Lagoon . Missing the pickup time does not entitle to a refund of the price paid for the tour. Our driver/guide will always try to contact you through the hotel reception if he is unable to find you in the lobby. Drop off after day tours is at your hotel or at a different location in the capital area of Reykjavik by request to the driver/guide. There is no refund if we cannot locate you at the airport when you arrive and we wait with a sign with your name on it and you not contact with us by [email protected] or phone 00 354 846 3837 due 45min then plain lend. This applies also to our tours and departure transfers, to be ready on time is your responsibility. Clothing: Iceland is a place with very unstable weather, please look at the weather forecast for the day and prepare. Bring your sunglasses, warm clothes(windproof/waterproof) and wear good shoes(best GORETEX), have spare socks and rain gear. More layers of clothes, gloves and headgear = warmer day. Tour operations: BTI travel operates tours & transfers in small buses or minivans of a maximum of 17 passengers. 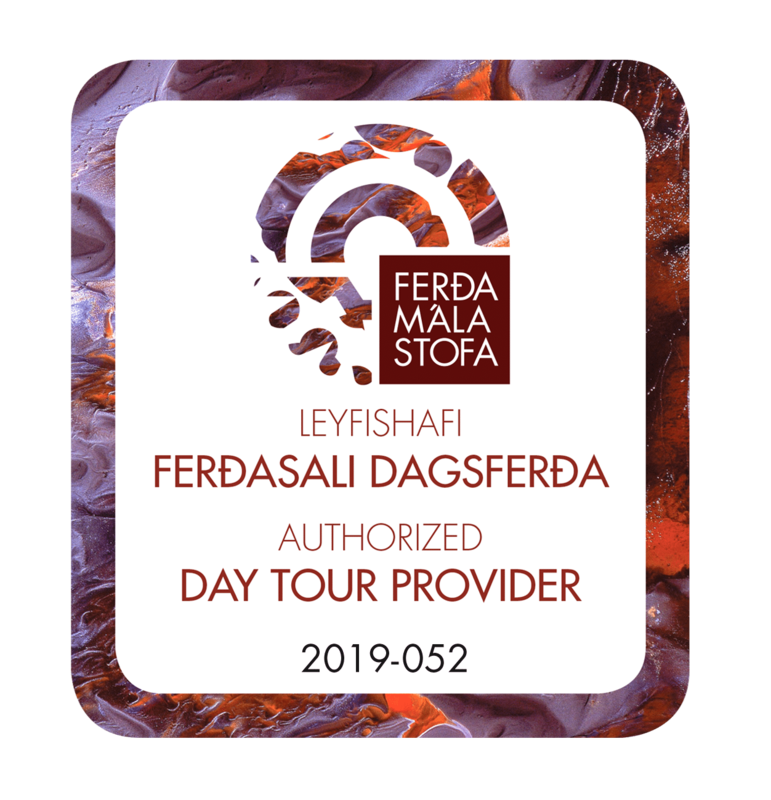 We are a small operator on the Icelandic market so we might use services from other small tour operators, reasons could be that our bus has reached it’s full capacity, or we have to few participants booked on that day. We have mutual agreements with other small tour operators that we trust to handle the task. All our vehicles are registered at Iceland Road Traffic Directorate. For your safety always use a seat belt, for it is mandatory in all Icelandic vehicles – safety first. Passengers with special needs: We can arrange a seat for a toddler or child, but it is important that you let us know if such a service is required. If you have any special needs or requests you should let us know as soon as possible either via email to [email protected]. If you need any assistance, don’t hesitate to contact us! Thank you for reading through our conditions and we welcome you to participate in our tours !